Beinahe im Wochentakt präsentiert Zazzle gerade neue Verkaufslösungen mit bahnbrechendem Charakter. Nach dem Zazzle Panel, dem Flash Panel und Zazzle Pulse kommt jetzt die Zazzle Product Engine. "We are extremely proud of Zazzle.com as a destination site and wanted to bring our technology to an even larger audience," added Robert Beaver, Chairman and CEO of Zazzle. "The Zazzle Product Engine now offers an unlimited variety of websites to provide their users with all of the unique and powerful Zazzle tools that were only previously available on our site." "As part of the Web 2.0 ecosystem, we felt the time was right to let consumers mash up content from anywhere onto t-shirts, postage, cards, mugs and posters," said Tuoc Luong, Chief Technology Officer and Vice President of Engineering at Zazzle. 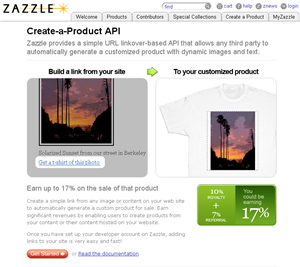 "We're excited about our first offering under the Zazzle Product Engine, the Zazzle Create-a-Product API, which scales infinitely, and allows individual sites to easily offer their users the opportunity to create unique custom products directly from their site." Auf Basis der Product Engine lassen sich nun auch sehr spezielle Produkt-Konfiguratoren entwickeln. Die Nummernschildershirts und Shirts mit Namensschild sind vergleichsweise primitive Beispiele. Spannend wirds, wenn die ersten virtuellen Produktautomaten die Schnittstelle nutzen.